The Icom IC-7300 saw its debut at the Tokyo Hamfair August 2015 and was the star of the Dayton Hamvention May 2016. 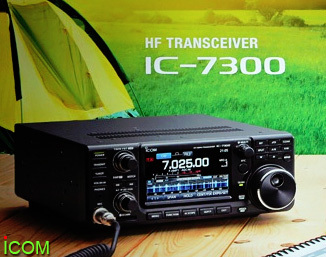 This new HF plus 6 meter 100 watt transceiver hosts new capabilities and technologies for its class. Receive coverage is 30 kHz to 74.8 MHz. Transmit is: 1.8�999, 3.5�999, 5.255�405*, 7�3, 10�.15, 14�.35, 18.068�.168, 21�.45, 24.89�.99, 28�.7 and 50� MHz. Instead of the conventional superheterodyne system, a direct RF sampling approach is used. The brilliant TFT touch screen provides complete operational status including a stunning real-time spectrum display with waterfall plus a useful audio scope display. There is a built-in tuner. Other features include: Voice memory, 15 Band Pass Filters, CW/RTTY memory keyer functions, RTTY decode, SD card slot, USB for CI-V and audio I/O, digital noise reduction and 101 memories. Only 9.45 x 3.75 x 9.37 inches (240x95x238mm). Supplied with HM-219 hand mic, printed Basic Manual, CD with Basic and Full Manual, DC power cord plus plugs and spare fuses. *60 meter channels in memory. On live display in Universal Radio showroom. Stop in for a look! #6525 OPC-420 Shielded control cable for AH-4. 32 feet (10m). T.B.A.